In my last post “Blogging, Podcasting, or Youtube? 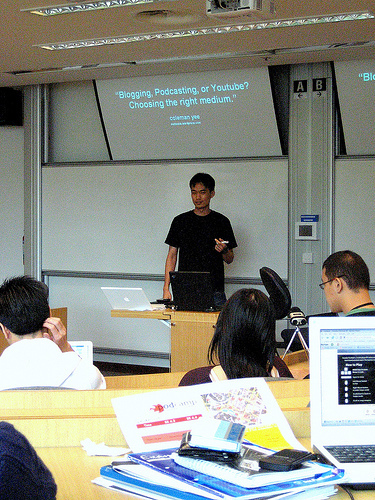 Choosing the right medium” – Podcamp Singapore, I talked about my experience as a speaker at Podcamp Singapore. For a long time, I wanted to try out a different way of using PowerPoint – using both the whiteboard and PowerPoint concurrently without having to move the projection screen up and down – and Podcamp was a great opportunity to do that. 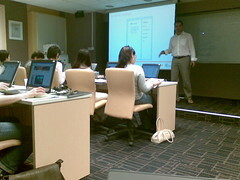 Notice that I was only using the top third of the screen for the PowerPoint slide. Which meant that I could use both the whiteboard and my PowerPoint slides at the same time. I used a black background on my PowerPoint slide, so that the projection wouldn’t interfere with the whiteboard. The text (in white) occupied only the top quarter of the slide. I could have used a lighter background for the top part of the slide, but black was easiest. My original plan was to pull the projection screen a third down, but the technology was too smart – the screen could only go all the way up (and the projector would turn off automatically), or all the way down. Thankfully I could slide the projection screen behind the whiteboard, resulting in a sloping screen, but it turned out fine. Here’s a shot of another slide. 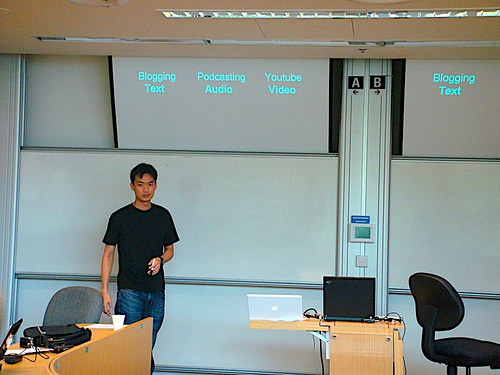 Thanks to the Podcamp Singapore organisers for these shots.